It's January. Cue the onslaught of "2012 In Review" blog posts. Phew...now that that's off my list, I've had another post turning around in my bran that I want to share: how-to love mountain biking. I have not always loved this great sport. 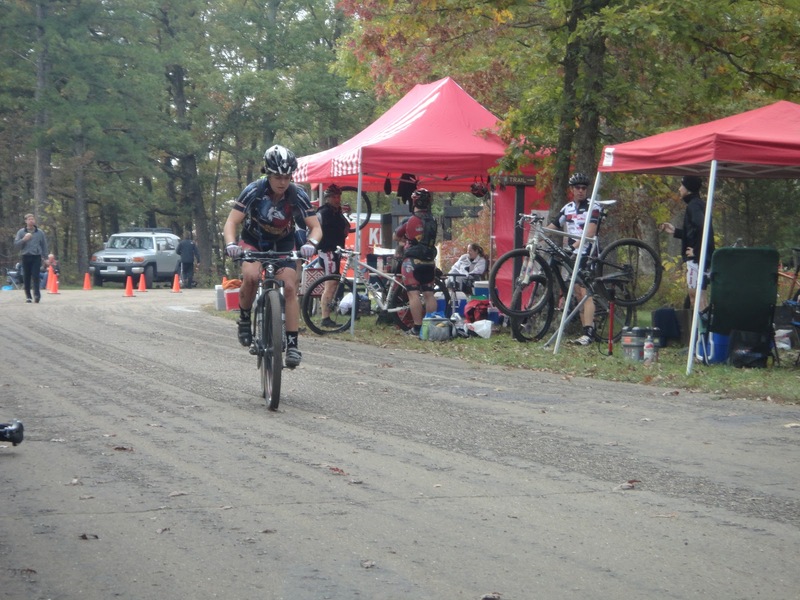 In fact, for a good 12 months (maybe more), I was downright fearful of knobby tires. I only bought a mountain bike in the first place because a cute boy asked me to go adventure racing way back in 2009. Truthfully, I was scared out of my mind of riding on anything besides pavement, but I said yes anyway because I felt daring for 30 seconds. And then got scared again. Blast from the past! Me riding my 26" hardtail, with V-brakes in the 2009 Castlewood 8hr AR. Oh yeah. I found a bike on craigslist that sounded like it could complete an 8hr AR, and promptly bought it. A very kind co-worker took pity on me and the 2009 Specialized Women's Myka HT Comp. I brought it over one day and we (uh...he worked and I watched) gave it a thorough tune-up. 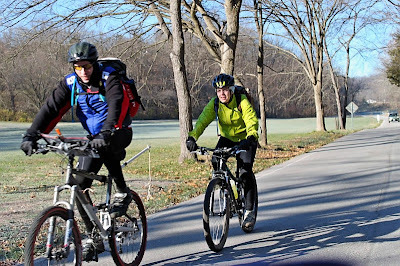 Then we took it out for a quick spin on the very-beginner-friendly singletrack at Creve Coeur Park. And, I kid you not, I crashed in the first 10 feet of the trail, trying to ride over a 1 inch twig. Not exactly a good omen for trail confidence! We finished out the ride with no more catastrophes, but it was clear that I would have to work hard at gaining any sort of handling skills on the dirt. Dirt Crits, "C" race, 2010. 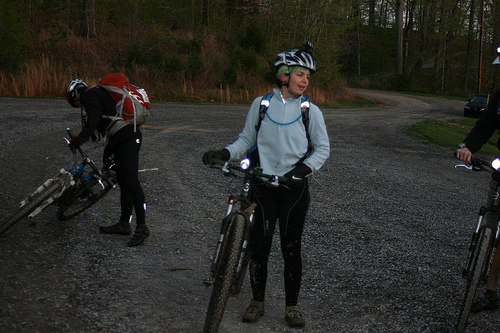 Summarizing 2010 and 2011, I rode my mountain bike occasionally. Most of my rides involved some level of fear/apprehension/anxiety when we were on singletrack. I remember doing lots of night rides at Lost Valley with a great group of women, and being sincerely relieved anytime we popped out onto the doubletrack for a few miles. I was never scared enough to say "no" to a mountain bike ride, I was just always grateful when it ended. Finish line at 2010 LBL 24hr AR. In 2012, that all changed. Now I relish riding my mountain bike, I look forward to singeltrack, and I am sad (usually) when it's time to finish the ride. I can attribute my change of heart to a few reasons and I'd like to share those, in the hopes of encouraging any aspiring mountain bikers to enjoy this wonderful sport. Mid-race at 2012 CPT Nats. If you've found your way to my blog, chances are you are already an adventurous sort, reluctant to admit that anything is "too hard" or "too dangerous" or "too scary". I certainly felt that way about technical singletrack when I started riding mountain bikes. I forced myself to ride anything and everything with the skills I had at the time. That led to a lot of crashes, or near crashes, or putting feet down, and generally reinforced my subconscious fear of rocks and roots. This year, I adopted a completely different approach: I walked. When things looked too scary for me to ride them on-sight, I hit the brakes and got off the bike. No guilt. I would take a few minutes to look at different lines, visualizing myself riding the correct one, and then either get back on the bike for a try, or just walk through the tricky section. This strategy isn't going to win you any races, but it helped my confidence a lot to have those few extra looks at the hard stuff. It also helped that I ride a lot of the same trails, so on the next visit to that area, I would be more likely to attempt something on-sight. That built my confidence in a way that barreling through obstacles never could. Again, this strategy doesn't help to build speed, instead it builds skills/confidence, which will translate to smoother riding that is ultimately faster. 2012 Crankworx 3hr in Cape Girardeau. MO. #2: Lean into your turns. There is a certain person on my mountain bike team who is notorious in the St. Louis community for being.....direct. As in, if he thinks you're wrong, you'll hear about it, loudly. Which can be intimidating for an inexperienced mountain biker like me, but when I ride with this dude, I have found that he is nothing but helpful and encouraging. This piece of advice came from a session at Greensfelder where I was struggling with downhill switchbacks (and I continue to struggle with them, but with this advice in mind). It sounds counter-intuitive, but when riding downhill turns/switchbacks, you need to lean forward and over your handlebars to put weight on the front wheel, which improves traction and reduces the chance of washing out, allowing you to carry more speed (read: brake less) through the switchback. 2012 Alpine Shop Dirt Crits, "B" race. Photo by Dan Singer. #3: When you get scared, let go of the brakes. 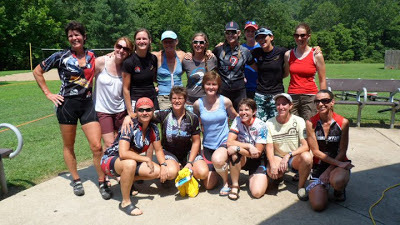 This one is a gem taught to me by my riding buddy and mountain bike teammate Sally. We were riding (also at Greensfelder) through a gravelly, washed-out downhill section full of shelf-y rocks, where the best line is an S-curve. It's tricky, and I had a death-grip on my brakes trying to creep the bike along. She would not have any of that. "Emily, when you get nervous, you need to let go of the brakes, just for one second, let the bike right itself underneath you and then you can slow down again". The thing about most mountain bikes is, they want to stay upright. The want to keep moving forward. So when a nervous-nellie rider snatches at the brakes, the bike's natural momentum gets disrupted and you're more likely to lose balance and crash. So force your fingers to let go of the brakes, allow the bike to track a few seconds, and then check to see if you actually need more brakes. Chances are, you won't. 2012 Burnin at the Bluff. This one is a mantra taught to me by one of my most frequent riding partners. Once you get your confidence up, speed is your friend. Really. 90% of the time I screw up riding tricky stuff, it's because I didn't have enough speed. Sometimes it's because I was intimidated, or maybe I didn't realize that an obstacle was coming up, but slowness can really hurt your chances of clearing a tricky section. Of course, it can also increase your chances of a harder crash, but that's why your confidence needs to be in place before adding momentum. But one of the biggest lessons I've learned this year is that you can clear SO MANY tricky sections just by staying balanced and pedaling. Pedalpedalpedal. Me, The Claw, Struckman, Young Ben, Sally on a training ride. The trails were too wet that day. Photo by the Pfoodman himself. 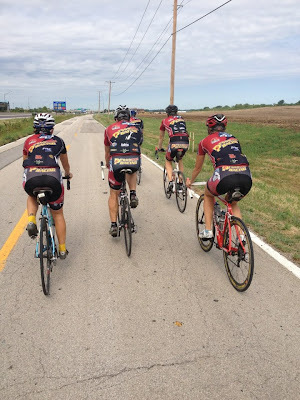 #5: Find a great crew of riding buddies. AND RIDE. You don't all have to be the same speed. I ride with people faster than me A LOT. And either they're content to ride behind me (saints), or they wait at various spots on the trail for a re-grouping. Both strategies are fine with me, I'm just glad to have company in the woods. Solo road riding is cool, but I prefer to have another person with me on singletrack just for safety. But the only way you are going to get better at something is to DO THAT THING. It wasn't until 2012 that I started to put significant and consistent miles in on my mountain bike. Surprise...it wasn't until 2012 that I started enjoying myself on the trails. 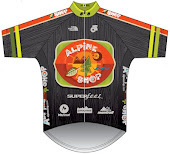 So thanks to HH, the Alpine Shop crew, and the Pfoodpeople for riding with me so much! We have an amazing group of mtb women in STL. 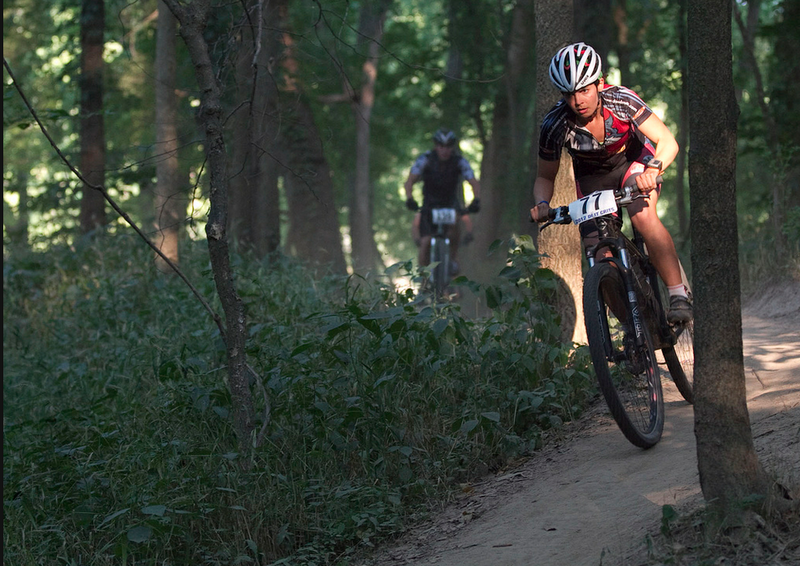 Photo from 2011 Castlewood XC race. OK. So that's EK's Top 5 Tips for Loving Mountain Biking. Hopefully they will help if you are a newish rider. But hey, I still consider myself a newish rider. I'm just trying to put some suggestions out there and see what sticks. If you have other tips please leave a comment!! I love mountain biking because it is the one sport that everyone is really helpful and respectful to everyone. fantastic post. thank's for sharing Love Mountain Biking. I also ride on mountain bike on vocationally. Actually, I pass my time always busy though have enough interest for mountain biking. Thanks for sharing your post with us.